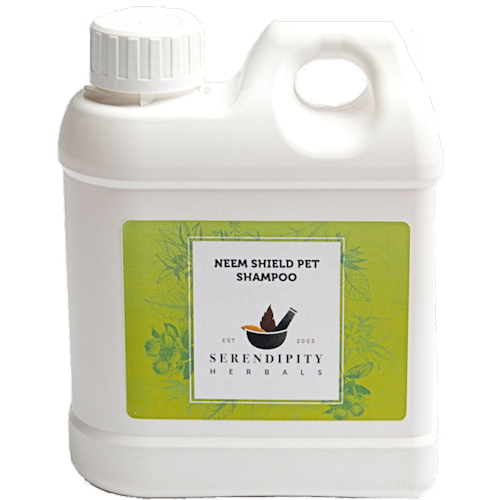 Neem Shield Pet Shampoo has a powerful natural formula that harnesses the intrinsic properties of neem to improve coat condition, freshness and for the general comfort of your pet using safe and gentle natural ingredients. 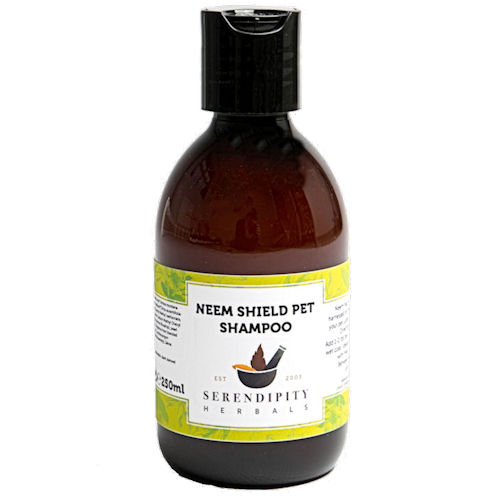 Neem Shield Pet Shampoo is suitable for dogs, horses & people but not suitable for cats, due to essential oil content. Sore or irritated areas may also benefit from the application of NEEM SHIELD CREAM or PURE NEEM OIL. fragrance from blended essential oils* of Lavandula Augustifolia (Lavender), Cymbbopogon schoenanthus (Lemongrass), Rosmarinus officinalis (Rosemary), Salvia oficinalis (Sage Oil). I am using this to treat my Dachshund puppies Demodex mites naturally as the chemical treatment from the vet made her very sick. I am using this twice a week alongside the neem shield spray and pure neem oil mixed with coconut oil. In 4 weeks her fur has grown back and she appears so much healthier. Thank you Julie for your help and support.. Excellent product, used on my terrier for the last two years, together with the neem shield pet spray. I refuse to use the chemical treatments for any of my animals, and this is a very good alternative. Lovely smell and obviously works, my dog has been free from biting insects since using this for the last 2 years. Great purchase. Seems ok only used it first time yesterday so need a few days to see what coat is like. This is the best shampoo I have ever used for my Bichon Frise. Highly recommend it and although not cheap well worth the money as a little goes a long way and it lasts ages.